George Evans Moule was born on 28 January 1828, the second of eight sons of Rev Henry MOULE [1801-1880] and his wife Mary Mullett Evans. He was duly baptised on 14 April that year by his father, the curate in charge of the church of St Mary the Virgin in Gillingham . In 1829 however his father became the Vicar of St George’s church in Fordington and he spent his youth at the vicarage growing up in the company of his brothers. He was taught up to the age of 16 by his father, along with other paying pupils that his father prepared for University. Early in the year 1844 he underwent a sudden conversion, the result of a sermon on Acts 28:24 by Rev Augustus Handley his fathers curate. He was a great friend of the family with his youngest brother Handley Carr Glyn Moule [1841 - 1920] taking his first name from him. The effect of the sermon never passed away conditioning the whole course of his subsequent life. Like his elder brother Henry Joseph Moule [1825 - 1904] he was educated at the University of Cambridge entering Corpus Christi College at the age of 16 on 20th May 1844. In this year He soon won a Mawson scholarship (so named after a previous master of the College called Matthias Mawson) and in 1850 he graduated with mathematical and classical honours as senior optime. James SCHOLFIELD the regis professor of Greek, and Frederick Foster GOUGH a Church Missionary at Ningpo China (1849-1881) helped to turn his thoughts to work abroad. He was ordained Deacon in Salisbury in 1851 and priest the following year, serving as curate to his father in Fordington between 1851 and 1855. Apart from officiating at well over 200 baptisms and burials in St George's church, he also tutored his fathers paying pupils. 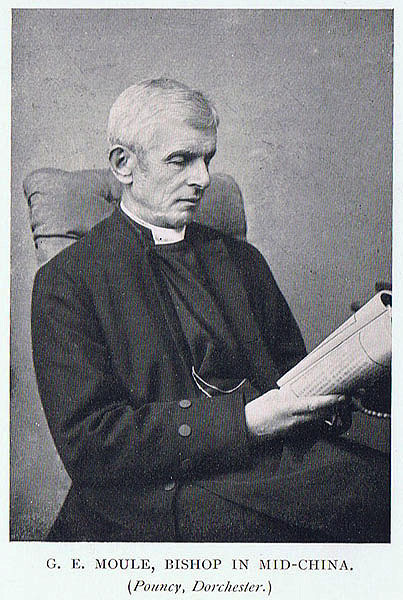 From 1855 to August 1857 he was Chaplain of the Dorset County Hospital and it was in that year that he was accepted as a missionary by the Church Missionary Society. After patient preparation and despite doctors warning him that he would probably fail under Far Eastern conditions he sailed in December 1857 for Ningpo in China. On the way there he landed at Hong Kong to be married to his cousin, Adelaide Sarah (1828-1909) the widow of Captain Henry Charles Griffiths. 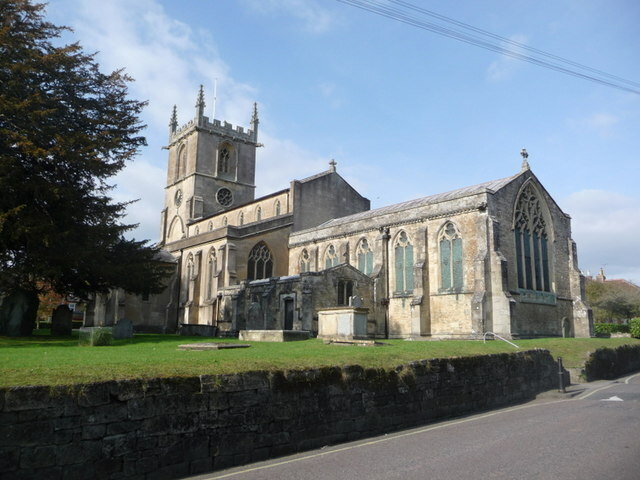 Adelaide had been Baptised on 12 November 1828 in Melksham the daughter of his fathers brother Frederick Moule, an attorney of law. She had married Captain Griffiths in Bengal India on 1st February 1847 at Allahabad in West Bengal. Six months earlier her elder sister Fanny Elizabeth Moule had also married at Lucknow in Bengal on 6th October 1846 to a George Augustus Frederic Hervey. I have not however been able to trace Captain Griffiths death or found any reference to children. The Moule family had long associations with India and the Bengal Army in particular. Some twenty nine years earlier his father had married his sister Elizabeth Jane Moule to a Colonel Christopher Sullivan Fagan of the Bengal Army and close ties had been maintained ever since. Following Captain Griffiths death Adelaide appears to have remained with her sister or other relations in India. It is difficult to see when George Evans and Adelaide would have met (apart perhaps from family visits with his father or trips from university to Melksham prior to Adelaide going to India) so it seems to have been an arranged marriage suitable to both parties. The Church Missionary society preferred its missionary's to have the stability and support of a family and Adelaide having been widowed needed support. During this period George’s uncle Horatio Moule was Chaplin at St Paul’s Cathedral in Calcutta, so he may also have been involved. There is no doubt however that Adelaide shared his missionary zeal accompanying him on his travels throughout China. George started work at the Chekiang Mission in Ningpo in 1858 and was joined by his brother and lifelong colleague, Arthur Evans Moule in 1861. They experienced at first hand the Taiping Rebellion which still stands as the second bloodiest conflict in history with an estimated 20 million killed between the years 1850 and 1864. 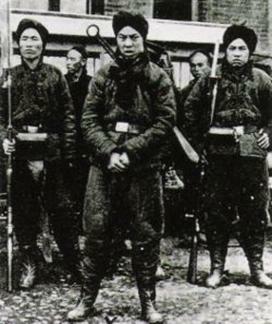 They were repeatedly in imminent danger when Ningpo was taken and retaken. It is a time George was later, as Archdeacon Moule, to preserve a vivid memory of in his book “Fifty Years in China”. The rebels took and sacked Hangchow in 1863. The following year at the earnest insistence of his Chinese helpers, George Moule became the first representative of the CMS to serve away from a treaty port. He opened missionary work in the humbled and decimated city and formed a permanent mission there. In 1864 he became a member of the Royal Asiatic Society (China Branch) and most of his writings were papers in its journal. After he had been at the station 18 months a regular congregation of about 40 were accustomed to meet together for service on Sunday mornings and on Whitsun Day 1866 five converts were baptised - the first fruits of Hang-chau. From that time he took up residence in that city, where he lived until 1911. He had a small house whose garden door opened onto a narrow lane in the heart of the city. In time it became a beloved abode to him and his many European visitors who described its simple refined charm and the delights of the small garden where his intense love of flowers found some scope. During this time he collaborated with his old mentor Frederick Foster GOUGH on the revision of The New Testament in the Dialect of Ningpo B.F.B.S which was published in 1868. George & Adelaide had seven children, all but one born in China but only four outlived him. He must have paid several visits home as his son Charles Frederick Moule was baptised at St Georges Church fordington by his father on 26th January 1865 and there is a picture of him and Adelaide with the rest of the Moule family on the lawn at Fordington Vicarage dated 5th August 1869. He evangelised widely, on river banks and in the hill districts and while at Hang-chau translated portions of the Prayer Book, consisting of the Morning and Evening Prayer, and the Litany, into the Hang-chow colloquial dialect which was printed there in 1874. In the year 1876 he returned to England and carried out pastoral work in Dorset among old friends, and made many new ones in the process. He was made a Doctor of Divinity in 1880, and also on 28th October that year, consecrated in St Paul's Cathedral as the first Bishop of Mid-China being placed in charge of a part of the old North China Diocese. His work steadily developed and visits to the different stations in his diocese involved him in long journeys covering annually some thousands of miles (for example he covered over 3,000 miles in 1892). He ordained many converts as deacons and priests for ministration to their own countrymen. A remarkable display of the affection in which he was held took place at the celebration of his 70th birthday, when he was the recipient of many gifts from his fellow missionaries representing various denominations in England and America. On this occasion the native Christians who owed their faith largely to the zeal and sympathy of their Bishop presented him with a scroll of embroidered satin 90 feet long on which were inscribed the names of 2,300 native Christians in Hang-chau. George not only witnessed the Taiping troubles but also the Boxer Rebellion, a crisis that lasted from Nov 1899 to September 1901. Hangchow was threatened and he was finally persuaded by the Consul to retire for a time to Shanghai. When he returned it was to find that his friends, the Chinese officials, had kept his house and its contents intact from injury. In 1905 he was made an honorary Fellow of his old College at Cambridge and in 1907 then being 79 years old he resigned as Bishop. His beloved wife Adelaide died aged 81 on 29th March 1909 at Hangchow having been an active missionary by his side for 52 years. "George Moule was a man of wide interests: music, drawing, woodturning, medicine, swimming, botany (he introduced some hitherto unknown plants to science), and especially literature; all attracted him, and he attained exceptional command of the Chinese language, literary and colloquial. All this however was secondary to his missionary work, at which he laboured incessantly by prayer, preaching, teaching, translating and church administration. During his time in China he had considerable success relative to that of his colleagues: the church membership in Chekiang increased from fewer than 100 to more than 4,000. It was a son of one of his early pupils who became the first Chinese bishop - Tsaeseng Sing. gentleness, reverence, humour, courage and diligence were conspicuous in Moule, endearing him to a wide and varied circle of friends. Notes on Hangchow Past and Present & Faith and Duty. (2). Oxford University Alumni - register of students, graduates, and officers who attended Oxford University between 1500 and 1886. Original data: Foster, Joseph. Alumni Oxonienses: The Members of the University of Oxford, 1715-1886 and Alumni Oxonienses: The Members of the University of Oxford, 1500-1714. Oxford: Parker and Co., 1888-1892. (6). Times Newspaper Obituary The Times (London, England), Monday, Mar 04, 1912; pg. 11; Issue 39837.